Tori shōgi (禽将棋 or 鳥将棋, 'bird chess') is a variant of Shogi (Japanese chess), which was invented by Toyota Genryu in 1799 despite being traditionally attributed to his master Ōhashi Sōei. It was first published in 1828 and again in 1833. The game is played on a 7x7 board and uses the drop rule; it is the only traditional Shogi variant besides Wa Shogi to do so. This is one of the more popular shogi variants. There were tournaments in London and Royston in the 1990s and early 2000s. The objective of the game is to capture your opponent's phoenix. 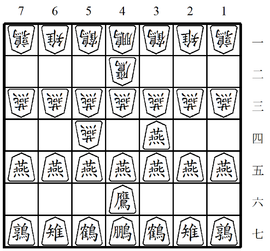 Two players, Black and White (or 先手 sente and 後手 gote), play on a board ruled into a grid of 7 ranks (rows) by 7 files (columns). The squares are undifferentiated by marking or color. In line with the bird theme, each piece is named after a different kind of bird. The pieces of the two sides do not differ in color, but instead each piece is shaped like a wedge, and faces forward, toward the opposing side. This shows who controls the piece during play. The first pronunciation of each piece is the Japanese pronunciation, while the second is the Sino-Japanese pronunciation. The promoted pieces (*) are usually called eagle and goose in English. The players alternate making a move, with Black moving first. (The traditional terms 'black' and 'white' are used to differentiate the sides during discussion of the game, but are no longer literally descriptive.) A move consists of moving a single piece on the board and potentially promoting that piece, displacing (capturing) an opposing piece or dropping a captured piece onto an empty square of the board. Each of these options is detailed below. An opposing piece is captured by displacement: That is, if a piece moves to a square occupied by an opposing piece, the opposing piece is displaced and removed from the board. A piece cannot move to a square occupied by a friendly piece (meaning another piece controlled by the moving player). Each piece on the game moves in a characteristic pattern. Pieces move either orthogonally (that is, forward, backward, left, or right, in the direction of one of the arms of a plus sign, +), or diagonally (in the direction of one of the arms of a multiplication sign, x). The step movers are the phoenix, falcon, crane, and the 8 swallows on each side. The eagle can move along a limited number (2) of free (empty) squares along a straight line in certain directions. Other than the limited distance, it moves like ranging pieces (see below). The pheasant and goose can jump, that is, they can pass over any intervening piece, whether friend or foe, with no effect on either. The quail and eagle can move any number of empty squares along a straight line, limited only by the edge of the board. If an opposing piece intervenes, it may be captured by moving to that square and removing it from the board. A ranging piece must stop where it captures, and cannot bypass a piece that is in its way. If a friendly piece intervenes, the moving piece is limited to a distance that stops short of the intervening piece; if the friendly piece is adjacent, it cannot move in that direction at all. A player's promotion zone consists of the two farthest ranks, at the original line of the opponent's falcon and beyond. If a piece crosses the board within the promotion zone, including moves into, out of, or wholly within the zone, but not including drops (see below), then that player must promote the piece at the end of the turn. Promotion is effected by turning the piece over after it moves, revealing the name of its promoted rank. A falcon promotes to an eagle. A swallow promotes to a goose. When captured, pieces lose their promoted status. Below are diagrams indicating each piece's movement. Pieces with a grey heading start out in the game; those with a blue heading only appear on the board after promotion. Betza's funny notation has been included in brackets for easier reference. The phoenix is the "royal" or "objective" piece. This is the move of the drunk elephant in chu shogi. It can move one square orthogonally forward or backward. (FfbW) That is, it can move to any of the six adjacent squares ahead or behind it, but not directly to the side. This is the move of the ferocious leopard in chu shogi. Because of its unusual movement, a pheasant can only reach half the squares on the board. Because of its unusual movement, a goose can only reach about a quarter of the squares on the board. Captured pieces are truly captured in tori shogi. They are retained "in hand", and can be brought back into play under the capturing player's control. On any turn, instead of moving a piece across the board, a player can take a piece he has previously captured and place it on any empty square, facing the opponent. The piece is now part of the forces controlled by that player. This is termed dropping the piece, or just a drop. A drop cannot capture a piece; that requires an additional move. Pieces that are dropped in the promotion zone do not promote as a result: Promotion requires that piece make a normal movement on a subsequent turn, as detailed under "Promotion", above. Pieces that are promoted when captured lose that promotion; they are unpromoted when dropped back on the board. A swallow may not be dropped on the furthest rank, since it would have no legal move on subsequent turns. A swallow cannot be dropped where the opponent would have no way to prevent his phoenix being captured on the next move. In other words, a swallow cannot be dropped to give immediate mate. When a player makes a move such that the opponent's phoenix could be captured on the following move, the move is said to give check to the phoenix; the phoenix is said to be in check. If a player's phoenix is in check and no legal move by that player will get the phoenix out of check, the checking move is also mate, and effectively wins the game. A player is not allowed to give perpetual check. This is not a rule in itself, but arises from the repetition rule. Either the checker has to break off the checking, or the checked side has to stop evading, after which his phoenix is captured. The rule for repetition (千日手 sennichite) in tori shogi is that if the same position occurs three times with the same player to play by repetition of moves, the player starting the sequence must vary the move. For two positions to be considered the same, the pieces in hand must be the same, as well as the position on the board. A player who captures the opponent's phoenix wins the game. In practice this rarely happens, as a player will resign when checkmated, as otherwise when loss is inevitable. Games between players of disparate strength are often played with handicaps. In a handicap game, one or more of White's pieces is removed before the start of play, and White plays the first move of the game. Note that the pieces removed at the beginning play no further part in the game - they are not available for drops. The imbalance created by this method of handicapping is not as strong as it is in chess, because material advantage is not as powerful in tori shogi as in chess. Other handicaps are also occasionally used. The relationship between handicaps and differences in rank is not universally agreed upon. The method used in English-language texts to express shogi moves was established by George Hodges in 1976. It is derived from the algebraic notation used for chess, but differs in several respects. Modifications have been made for tori shogi. If a move requires the player to promote the piece, then a + is added to the end to signify that the promotion was taken. For example, SWx4a+ indicates a swallow capturing on 4a and promoting. In cases where the above notation would be ambiguous, the designation of the start square is added after the designation for the piece in order to make clear which piece is meant. For example, if Black has a crane at both 3c and 5c, which can be moved to the square 4b in front of the phoenix, then these are distinguished as Cr5c-4b (moving the left one) and Cr3c-4b (moving the right one). Optionally, a prefix may be added to the quail to distinguish the left quail from the right quail, LQ and RQ, when the left quail appears to the right of the right quail. In handicap games White plays first, so Black's move 1 is replaced by an ellipsis.